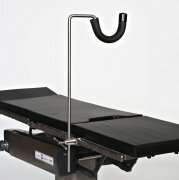 This inexpensive surgical leg prep can be attached to virtually any operating table using a standard side rail socket. Holds patient's leg comfortably during the prepping procedure. Wipes clean, easy to maintain, and very durable. Height adjustment up to 30"